After losing her husband to a sudden illness, Nicole Hagins found herself alone with six kids and no place to go. Help came from Seattle's Atlantic Street Center, one of 12 nonprofits aided by your donations to The Seattle Times Fund For The Needy. They were in Texas when the first house fell through. No big deal, Nicole Hagins thought, that’s why she’d lined up two. There was a fallback. The second house fell through when Hagins, her family and a U-Haul full of their belongings, were just outside of Portland. No fallback this time. Hagins, 41, and her six school-age children arrived in their new home city of Seattle in February, after a cross-country drive, with no home. 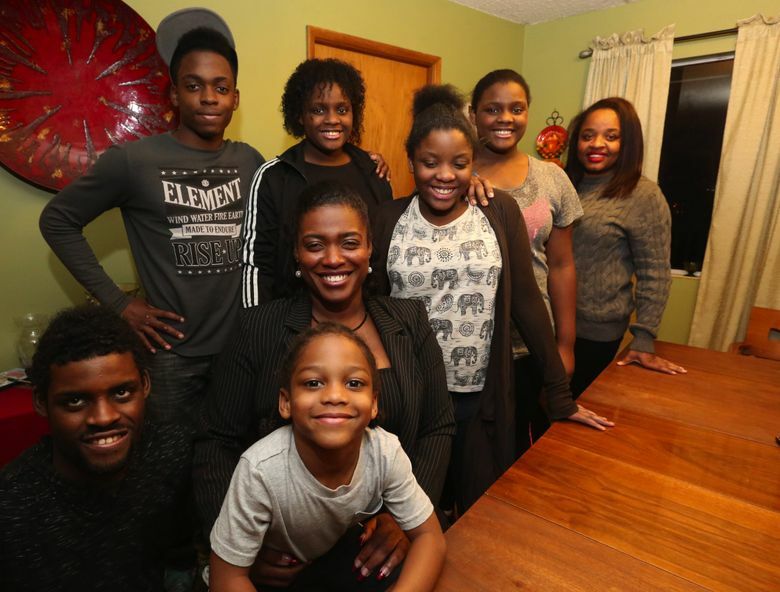 Spurred by family tragedy and guided by a Section 8 housing voucher and faith in God, Hagins had decided to move her children from their hometown in Central Florida to Seattle. She’d lined up two houses that she’d been told she could rent. But now she had nowhere to go and an SUV full of kids. They put their things in storage. There were two nights in a hotel. Then a week in a homeless shelter, which gave them a place to sleep, but nowhere to go during the day. Through a connection at her new church, Hagins was put in touch with the Atlantic Street Center, a Seattle nonprofit that provides services to families and children and is one of 12 agencies benefiting from The Seattle Times Fund For The Needy. There she met Kishan Scipio, a no-nonsense family advocate with a practically encyclopedic knowledge of public services available in King County. About 10 months later, with the help of Scipio and Atlantic Street Center, Hagins and her family have cycled through a transitional apartment and are renting a two-story house in Northgate. Her kids are all in school. Three of them play on a basketball team. She proudly shows cellphone videos of one son’s highlight reel for the Roosevelt High School football team. For more than 100 years, Atlantic Street Center has been providing services to help low-income families, mostly in South Seattle, raise healthy, successful children. Life took a turn about a decade ago for Hagins, a longtime corrections officer and law-enforcement deputy, when a workplace head injury led to a mild stroke. She tried to return to work, but remained at risk of further strokes and was deemed disabled. As hard as that was to accept, things would get much worse. About two years ago, her husband, Joshua, who had been in the Army National Guard, suffered cardiac arrest after an undiagnosed infection and died. He was 34. They’d been planning to buy a house. Instead, Hagins mourned. And prayed. She applied for public aid, something she’d never previously done. Out of about 19,000 applications that the Seattle Housing Authority received for Section 8 vouchers last year, hers was one of 2,500 randomly selected in a lottery. The voucher covers a portion of rental costs, but, as Hagins found out, there’s no guarantee of finding a house to rent. She has a hard time explaining all the ways that Atlantic Street has helped her since February. Scipio and Atlantic Street connected them with agencies to get a transitional apartment and then to rent her current home. For several months, Hagins and her kids dropped by Atlantic Street three or four times a week. Hagins took a parenting class on how to effectively talk to kids about difficult subjects, like drug abuse and teen pregnancy. Scipio helped the family find clothes when they were lacking. The Atlantic Street Center provides education, mental health and support services to children and families. Its work ranges from counseling and home visits, to parenting classes for teens, literacy programs and helping families find available public services. The agency primarily serves low-income families of color in central and south Seattle. She found an opening in a Head Start preschool program for Hagins’ youngest son, Joshua. For son Malique, 19, who has autism, use of the computers at Atlantic Street has “been everything to him,” Hagins said. But often the help was less tangible, if no less crucial. Scipio acted as a guide through the thicket of bureaucracy that can sometimes come with public services. Both women laugh when trying to count how many times Hagins has called since they met and Scipio gave Hagins her cellphone number. “That was a mistake,” Scipio whispered, laughing. When she lived in the transitional apartment, a period of about four months, Hagins would drive her children to school in the morning and her next stop would be Atlantic Street. Atlantic Street Center doesn’t just provide school supplies, teach classes or do counseling. It tries to identify what each family and each individual needs, and then gets them there. She and Atlantic Street Center’s 50-or-so employees served nearly 3,500 people last year. Edith Elion, who runs the center, has worked there for 40 years, first as a mental-health therapist, then as associate director and, for the past 14 years, as executive director. The work they’ve done with Hagins, Elion said, represents what they try to do with everyone they serve — get families healthy, comfortable and successful in their community.